Fernando Álvarez de Toledo, Third Duke of Alba, is one of the most formidable and controversial figures of the sixteenth century. He has been depicted as a great hero, an indefatigable defender of the Catholic faith, and a true buttress of the Spanish monarchy, but also as a terrifying man, the dark suppressor of the revolt in the Low Countries. 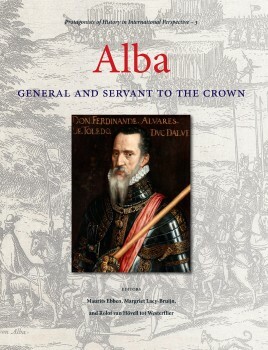 During his long and fascinating life Alba revealed wide-ranging skills and interests. A successful soldier, he was also a distinguished courtier and an influential diplomat serving his monarchs, Charles V and Philip II, without fail. Moreover, he was a maecenas and an avid art collector. Using a variety of sources, including previously unexamined data, sixteen leading historians from eight countries present newly developed insights and offer a nuanced image of the Grand Duque. Adopting different perspectives, they shed new light on this intriguing and influential leader, thus showing that Alba continues to be deserving of study and discussion. Maurits Ebben (1955) studied history at Leiden University and at the École des Hautes Études en Sciences Sociales in Paris. In his doctoral dissertation he explored the financing of the Spanish effort by Portugese bankers during the Eighty Years' War. Sinc 1992 he has been a lecturer at the Institute for History of Leiden University, where he teaches Dutch early modern history. Margriet Lacy-Bruijn (1943) is a native of the Netherlands but has spent most of her adult life in the United States. After studying at the Sorbonne and the University of Strasbourg and after earning degrees in French literature and lingustics at the University of Amsterdam, she completed her PhD in French literature at the university of Kansas in 1972. In addition to her work on the 18th-century French novel, she has published widely on Belle van Zuylen/Madame de Charrière. She was professor of French, dean of Humanities and Social Sciences, and associate vice president for instruction at North Dakota State University before holding similar positions at Butler University, where she retired in 2004. Rolof earned a LLM degree and a MA degree from the University of Leiden. He also received a degree in comparative law (MCL) from Columbia University. He has spent the last forty years practicing law in The Netherlands Antilles, Rotterdam and Jakarta. Driven by his life-long passion for history, he founded Karwansaray Publishers in 2007, a company dedicated to promoting and sharing a multi-faceted view of history that corsses cultural and political boundries. "The ultimate repository of all things Alba"